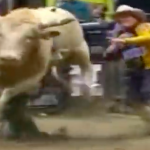 Roy Vs Nance from Laughlin is one of the greatest bull performances ever! We also included footage of Roy tossing Reese Cates in the championship round of the 2015 PBR BDVT in Salinas, CA. Roy, is a Half Brother to legendary bull Bushwacker, takes the top marks bucking off Cody Nance and scoring 45.75 in the championship round in the 2014 PBR BFTS Desert Showdown in Laughlin, Nevada. Julio Moreno Bucking Bulls elected to have Roy put down following the Ak-Chin Invitational after consulting with a local veterinarian in Buckeye, Arizona, because of the bull’s lower leg injuries. Roy had just bucked off 2015 World Finals event winner Cooper Davis in 2.43 seconds for a career-best 46.5-point bull score despite sustaining two broken front legs during the out. We have seen the footage and we have chosen not to share it. Bull riding and PBR fans were devastated last year by the passing of Mick E Mouse, a beloved bull , and now this. Roy PBR BULL was special and had something to prove just to get noticed because he was always in the shadow of his half-brother, three-time World Champion Bull Bushwacker. It didn’t bother PBR Bull Roy one bit that Bushwacker was bigger than him or that he had won more championships than he did.Roy was a fighter. His motor never stopped and he wasn’t going to let Bushwacker boss him around on the ranch. Roy would have turned 7 years old on April 1. Roy PBR Bull had as much personality as any you’d ever see. He was a bit of a wild child, always doing his thing. He was a small athletic bull who always showed up. Roy concludes his career with a 17-3 record on the BFTS and an Avg bull score of 44.93 points per out. 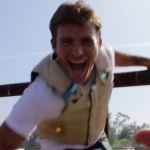 Roy scored 45.75 points for the performance in the video below(Nance), the second of seven consecutive 45-point or higher bull scores for the bovine athlete. He was the top bull on most nights and every rider knew a cover would be a career maker. His career is highlighted by the 3 memorable times he was ridden. (Viera, Aparecido, Nance). Many may remember Josh Faircloth being knocked out aboard Roy. Those rides along with his series with Nance are what most fans remember, but Roy gave many a short night. But we chose these rides versus Cates & Nance to remember ROY PBR Bull. Check out how far from the chutes this mighty mite of a bull travels! For whatever Roy lacked in size, he made up for in heart. This bull was like your short stubborn friend always getting in fights with bigger guys , he felt he was the king and gave in to no one. This was to be Roy’s year….and the sport is once again reminded of the fragility and danger of bull riding. -Kindra Moreno,owner: (via Facebook)“These bulls are incredible athletes and loved by our family, friends and fans. We thank the many of you who have reached out to us during this very difficult time. 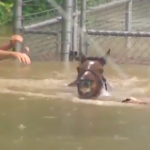 (VIDEO) AMAZING KID ROCK TUNE “COWBOY”/ VIDEO FOOTAGE FROM GUS TRENT RODEO FEST! (VIDEO)FOOTAGE OF JUSTIN MCBRIDE COVERING RANK BULL CHICKEN ON A CHAIN! 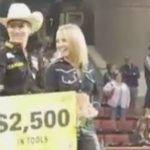 (VIDEO) FOOTAGE OF AUSSIE BEN JONES DANCING AFTER AMAZING PBR FINALS COVER! 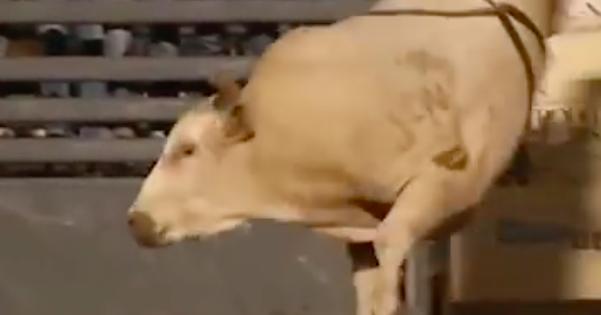 (VIDEO)FOOTAGE & INCREDIBLE PROFILE-THE DANGER & TOUGHNESS OF BULL RIDING!! (VIDEO) YOUNG JW HART IN A ONCE IN A LIFETIME WRECK-BULL CAUGHT IN CHUTE-FROM 1997 CALGARY STAMPEDE! 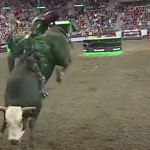 (VIDEO) PBR SUPER BULL STRAWBERRY WINE SACKED FOR 94 PTS!